The 25th May is significant for many reasons. On the Discworld, The People's Revolution of the Glorious Twenty-Fifth of May was the day that the revolution ended the increasingly tough reign of Lord Winder. It is also the day many Discworld fans wear the lilac as a tribute to Terry and meet up in various places worldwide. We also know the 25th of May as Towel day in memory of the great Douglas Adam, many of us choosing to carry a lilac towel on this day to celebrate both authors. For us, it is all these things and also, for one year only, the deadline for which we needed to sort out our website/mailing lists/online shop to make sure we were GDPR compliant (which as it turns out, we already were) . So here is that notice that you must have seen 50 million times before in the last few weeks from everything you ever signed up for online. GDPR Compliance Notice - We have updated our Privacy Notice on our website so we are now (and as it turns out have always been) GDPR Compliant. If you wish to not have your email address on our subscription lists then you have the option to unsubscribe . This month I was amused and saddened by the fact that the judging panel for the 2018 Bollinger Everyman Wodehouse prize decided, for the first time, not to award a comic fiction prize – because none of the books were funny enough. Terry won this prestigious award back in 2012 for his 39th Discworld Novel Snuff, beating both Sue Townsend and John Lanchester. The prize came in the shape of a Gloucestershire Old Spot pig named after the winning title "Snuff". A 50th anniversary: though I can't remember the day, I first met Terry in the first week of May 1968, when he arrived on our doorstep to interview my colleague, Peter Bander, editor of the book Looking Forward to the Seventies which we'd published on 29 April. It appeared in the Bucks Free Press on 10 May, signed T.P. and titled 'Education should not be a political toy') . And while I'm at it. Stephen Briggs' recently noted that on May 18th it was 27 years since he met Terry face to face for the first time. The deadline for submissions to issue 255 of Discworld Monthly is Friday 22nd June 2018. It's been a month for winning Awards with two different Terry related projects both bringing home beautiful awards. On the 9th May, the documentary Terry Pratchett: Back In Black won an Royal Television Society Scotland award in the Documentary and Specialist Factual: Arts category. Huge congratulations to the whole team at Pacific Quay Productions and BBC Scotland, especially Charlie Russell and the wonderful Paul Kaye. Extended congratulations goes to all the fans who appeared in the documentary. It doesn't matter if you were on screen talking about the christmas cards Terry used to send you or if only your pyjama legs were seen on a walk past at the UK convention, you all showed the world how diverse a fandom we truly are and Terry would have loved that his loonies got some screen time on a documentary about him. Earlier this year we told you about the Museums + Heritage award that the Terry Pratchett: HisWorld Exhibition at Salisbury Museum was nominated for. On the 18th May at the Historic Staterooms of London's 8 Northumberland Avenue in a glittering ceremony, Terry Pratchett: HisWorld took home the award for Temporary or Touring Exhibition. It was against some big hitters in the world of Museums exhibits from the Science Museum - London, People's History Museum, the National Trust, Ditchling Museum of Art + Craft, Victoria and Albert Museum and the National Museums Liverpool / Arts Council Collection. Huge congratulations to the team, The Salisbury Museum and Richard Henry. The months of work, preparation and planning were worth every moment. Everyone who saw the exhibition will agree it was an amazing glimpse into HisWorld. We headed to FCC Cardiff to see if we could snag a few minutes with the man who played Terry Pratchett in the award winning documentary Terry Pratchett : Back In Black. Luckily for us Paul was more than happy to give us a few minutes of his time to talk about his role as Terry. Paul told us that he'd never played a real person before and was quite worried about doing an impersonation of Terry. He added that he didn't really know anything about him before he was offered the part and said that he did a lot of research into him as a result and had started reading the books. He said he gained a huge amount of respect for the man we all know and love. Whilst on set he said it was made much easier to be Terry by everyone else being in character around him. We were a little surprised that he recognised our editor Jason from his small part in the documentary. When we asked about how it felt to be part of the team to win a RTS award he said he was ecstatic that the documentary won and he told us he was a little blown away by the amount of love shown for it by all the fans. When we saw Paul later at the photo shoot, he had his Terry Memorial pin on his jacket and he then added one of our Discworld Monthly Badge to the other lapel and wore it for the rest of the day. Paul is a really lovely bloke. If you ever get the chance to have a chat with him, go for it, he doesn't bite! The award winning HisWorld exhibition at Salisbury Museum amazed attendees who were, for the first time, given unparalleled access to the author's inner sanctum and writing room 'The Chapel' and the plethora of interesting artefacts that surrounded him. The book will be a collection of images from the exhibition with detailed descriptions. It will remind those who were there of how sumptuous the displays were and for those who weren't able to attend, a true glimpse of the magnificence of the exhibit. Available in a hardback edition and a collector's, slipcased limited edition. Discworld Day at Birdworld - Due to unforeseen circumstances Mr Rob Wilkins will not be able to attend the scheduled event this Saturday. Birdworld greatly appreciates the enthusiasm and interest that everyone has shown towards the event and therefore to avoid further disappointment they are not cancelling the day. To all of the fans planning to attend, Birdworld wants to extend their most sincere apologies for the unexpected occurrence and hope that you join them as planned for what they hope to be a fantastic day. PS. The team from Discworld Monthly will be there for those who wish to get free hugs and maybe a selfie or two. We love meeting our wonderful readers and can't wait to spend a day with you all. Terry Pratchett's Discworld novels are brought to life through the brilliant illustrations of Paul Kidby, who perfectly captures Pratchett's imagined world. Paul is best known for being the 'artist of choice' for the award-winning writer Sir Terry Pratchett. Paul has designed the Discworld book jackets since 2002 as well as many other Discworld publications. This exhibition comprises 47 pieces of Paul's Discworld artwork as well as a selection of artwork from his Charmed Realmed collection. Tickets: Adults 4GBP. Under 18s by donation. Terry Pratchett's Discworld Imaginarium Calendar 2019 will be released on the 23rd August 2018 worldwide. Rumours around the next installment of the Discworld Collector's Library have been inbound since January. We believe that we will be getting three editions this time around instead of four. They hopefully will be Making Money, Thud! And Unseen Academicals and should be available at the beginning of November. Perfect as hogswatch presents, the price of these appears to be the same as the last batch at 12.99GBP. More on these when we get full confirmation. Talking of Hogswatch presents, it appears we will be getting Illustrated editions of the Bromeliad series of books by Corgi. The first to be published will be Truckers with Mark Beech (current paperback cover illustrator) illustrating all three of the stories. Looks like it will be a september release date for this one. We can't wait for these as we love Mark's style. We forgot this one last month - A new version of the Discworld Reading order is now available in several translations. Thanks to Krzysztof Kietzman for his work on this. Backspindle Games has had to relaunch their MourneQuest game over on Kickstarter. We told you about this a couple of months ago, unfortunately they didn't quite reach their target last time around. Now they've streamlined the stretch goals and lowered their target. Mournequest is based on the book by Garry McElherron. The Dice Dungeon is a quick, two player game of Dice, Dungeons and Waffles. In the Dice Dungeon not only do you have to fight your way through a dark, dangerous dungeon, you have to build it as well. Two players compete to become the most experienced adventurer. Taking turns to draw dungeoneering dice from the bag, a player can roll a map to add to their route, equipment to help them get through, or a spell to aid their quest in other ways. Bernard has written his first solo novel. This is a novel about good and evil and the darker side of the antiques business. It is also a story about the power of friendship that spans generations. Like the antiques he restores, master craftsman Bill Sawyer knows that his interesting past could lead to a fragile future. In the autumn of his life, as his body begins to betray his skill, his dwindling days are about to become very interesting. The value of Bill's experience has not gone unnoticed, because things of value often attract dangerous attention. But it's no use growing old if you don't get artful. There is an old adage in the antiques trade that says 'not all that glistens is gold'. So you better believe that not all that's said to be Elizabethan is old. It might well be have been made yesterday. It's available now in paperback at the amazing price of 9.90GBP with various levels of worldwide shipping. ↑≡2.9 Troll Bridge News - The end is nigh - The trailer is HERE! On Mon 21st May at 23.28 BST, a notification dropped on our screens. A very important notification. "Snowgum Films has published a post…"
"TROLL BRIDGE is now submitting to film festivals worldwide. An old barbarian and his talking horse, embark on a suicidal quest to battle a bridge troll. 15 years in the making TROLL BRIDGE is an ambitious odyssey of work in bringing Terry Pratchett's Discworld to cinematic life. The post was accompanied by the happiest piece of film we have seen in a long time - THE OFFICIAL TRAILER !!!!! They've submitted the film to a load of film festivals and as soon as one accepts it, we will shout from the rooftops because it then won't be long until the distribution process begins and lots of beautiful parcels arrive through backers letterboxes containing the gold that is Troll Bridge on disc! Troll bridge's contract states that they can continue raising money while they are still in a position to spend money [on the film!] . Once the film has been completed and outstanding expenses covered, SnowGum Films may need to close off DVD availability. So if you want it on DVD or Blu-ray, order it now as you may not be able to get it later! This month we put a call out to some of our friends and they came back with some rather varied Trivia questions. We've not really validated the answers (we trust our friends) . Q1. What does 'Skund' translate as? Q2. Who is Tomjon's real father? Q3. Which Morporkian died in a cave in Holywood? Q4. In which book would you find a shopping mall? Q5. Authentic scumble (not the knock off stuff made by CMOT Dibbler) is made where and by whom? The answers as always can be found at the end of this issue! I attended GreenMan Theatre Troupe's performance of "Monstrous Regiment" in Elmhurst, Illinois, on Saturday, April 22. Chris Hainsworth, who wrote the original adaptation for the Lifeline Theatre in Chicago's popular Jeff Awards-recommended 2014 production, was available along with the GreenMan cast and crew to answer audience questions after this performance. The performance space in First United Methodist Church is small (smaller even than Lifeline's stage area) , but it had its advantages in bringing an immediacy to the action. The stage is not raised, so the actors were able to walk right up to and interact with the audience, which they did to excellent effect in the regimental recruiting scenes. There was no scenery, but the painted map of the Discworld on the stage floor conveyed the setting of the play, as well as the travels of the regiment itself. Cassandra Conklin's cheerful and resourceful Polly Perks kept the audience's interest as we followed her on her path from barmaid, to nervous "male" army recruit, to confident corporal. Sergeant Jackrum (Derek Dillon) was bluff, pragmatic, and accepting of signing up a ragtag band of increasingly improbable volunteers as the human recruits--Polly, stalwart Tonker, shy Lofty, and religious Wazzer--are joined by an Igor, the vampire Maladict, and the troll Carborundum. The Borogravian situation is more desperate than the recruits have been told, as they find little in the way of food, weapons, uniforms, or training before being sent to the front. Naive officer Lieutenant Blouse (Ryan McAndrews) is eager to lead them into battle (once he learns how to handle a sword) , but his book learning and openness to new ideas from his regiment help him in his command. Two versatile actors also played multiple parts: Brendan Mertens as the mustachioed Zlobenian Captain and Death; and Tom Ochocinski as the weaselly Corporal Strappi and world-weary General Froc. This script, while adapted for a smaller stage and cast, remains incredibly faithful to the book. All dialogue was taken directly from the novel. Justin Vidovic's direction kept the action moving at a good pace, while focusing on the interrelationships and cooperation of the squad's characters. Dramatic highlights of the performance included Tonker (Marnie Warner) and Lofty's (Therese Marie Caldwell) revelation of their reason for joining the army; Wazzer's (Katty Perrell) devotion to the Duchess of Borogravia; and Jackrum's touching conversation with Polly as he considers his future back in the civilian world. Comedic timing was well done, with the audience enjoying the characters' jokes and predicaments. Katie Soria's lisping Igor was very funny, particularly in a scene where Igor tries to stand at attention. Elizabeth Ley's vampire Maladict, dependent in a very crucial way on coffee, was hilarious in her unravelled attempts to cope without caffeine. Allison Porschakin, as the troll Carborundum, spoke in what I would describe as a "gravelly" voice and played her part with enthusiasm and good humor. (The grey troll costume was modeled closely on the book, down to the bits of lichen-like moss for hair.) A brief segment in this show, where Maladict and Carborundum are threatening each other, turned into a playful exercise of imitating each other. We enjoyed the play, as did the audience, many of whom appeared to already be Discworld fans (several in the cast were as well) . The after-play discussion with adaptor Chris Hainsworth and the cast and crew was enjoyable and informative. Both Hainsworth and director Vidovic commented on how pleased they were to stage a play that had such great roles for women. Lifeline Theatre's ensemble writes their own adaptations from literary works; their 2014 season had two plays on the theme of war, which had few roles available for their female colleagues, so Hainsworth suggested "Monstrous Regiment" as their third play. Hainsworth's adaptation was fortunately approved by Terry Pratchett for production, and was performed to great acclaim in 2014. Having seen both productions, I am pleased to say that the play is a fine introduction to Discworld for those not already familiar with it, and a pleasure to see for the established fans. The GreenMan Theatre Troupe obviously had great fun with their performance, and I hope that we will continue to see more Discworld plays performed in the Chicago area. The Tilt Theatre, City College, Kings Road, Plymouth, Devon. Student production by 1st years of the new Level 2 Diploma in Performing Arts and Level 3 Extended Diploma in Performing Arts. The small Theatre is so new that it still doesn't have a tag on google maps. The production was a fairly faithful following of the Stephen Briggs play book, several of the parts were filled by doubling up of the cast, apart from the principals. Started on time, a good beginning with any production. To manage the Character list they used a duo of Narrators / Footnotes, each seeking dominance over the other whilst present their lines. Preceded by a bell note before delivery of the lines and the cast froze in position, just as Stephen's notes suggested. The Footnotes often had some fun repositioning the frozen actors as they went. Sybil Ramkin, stage presence good, inclined to rush her lines but slowed down as she relaxed into the part. Nobby – good example of causal 'del boy' , fag hanging from mouth - lout, even had the double intendo needed. This actor even managed to slouch at attention. Sgt. Colon, needed padding up a bit but played well. Librarian- a little noisy at time but a perfect M******, ...um..APE. Patrician - needs work on the delivery of the lines but did know his part, looked suitably frightening. Death - imposing costume, seeing a girls face below the skull, well it was disconcerting but it worked with hollow voice projected from the speakers. Dragon - Seen as a painting, heard as a deep resounding voice, every inch a threat. Brothers, Doorkeeper,Plasterer, Fingers, Watchtower, Dunnykin, were suitably difficult for the Grand Master to keep in order. Servants and Guards and others all played by cast members doubling up, had quick changes, and odd lines to remember did well. One scene that the production added was a market day in Ankh-Morpork, in which they tried to depict the sheer bustling chaos of Sator Square. Some very nice touches in which CMOT Dibbler is selling sausages, an assassin is prowling and and mimes are performing, well done – as was the ending when the mimes were assassinated – for the public good. I spoke to a 1st year student Jody Grimwood (Media – Photography) , who was interested in lighting the set and scenes. She commented that although she was not a Terry Pratchett fan (yet!) she had enjoyed the production process, and felt that everyone had put time and effort into learning their lines and researching the parts given to them. Favourite bit. Errol flying....on a pole.! & Scene 19 in a pub, the ' he was a righteous man was Gaskin' line, The Librarian began looking through the hair of Sgt Colon, pick out bits and eating them, then Carrot joined in, got the laughs. Overall a good 1st year production, special effects were well done, luminous paint, glowing makeup, leathery wings sounds, lighting use of strobe contributed to the good effect of production. Wonder what they will do next?!!!! On what would have been Sir Terry's 70th birthday, I went to see Jingo performed by Castle Players Am Dram Society, Lytchett Matravers in Poole. This was a stage adaptation, by Stephen Briggs, directed by Steve O'Neill. In the programme, Steve admits it is a complicated play to stage, but he found it an enjoyable show to work on. The cast of 12 actors portrayed far more characters. On reading the programme before the show started, I realised that I knew the actor, Peter Bennett, who played Sam Vimes (We worked together many years ago) . As Vimes is one of my favourite DW characters, I had high expectations. I had recently re-read the book so was familiar with the plot, while my husband has never (yes, really) read any of Sir Terry's books, so didn't know what to expect. I agree with Steve that it is a complicated play to stage on a small stage. The solution was to use a variety of methods to enhance the acting: visual projection, sound effects, the cast describing what was happening etc. I thought this worked well. The sound effects were particularly er, well, effective, when Lord Vetinari goes to see Leonard of Quirm. I am very glad that the submarine scenes met my expectations. Steve thanks Clemency Bunn for the submarine, with its pedals, and it was visually very effective for these fun scenes. The cast were all great and they all portrayed the characters in a way I liked. 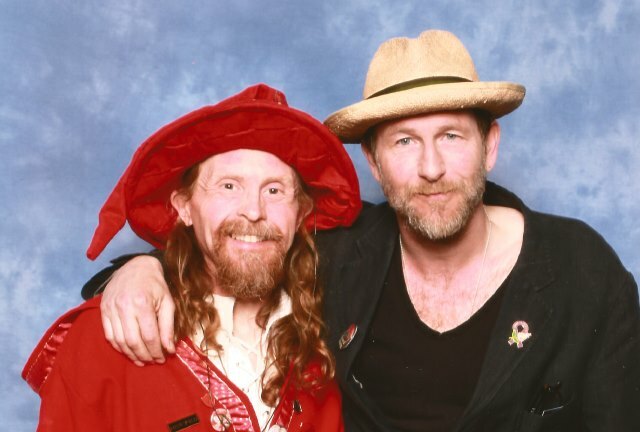 Peter was very good as Vimes and Simon Langford was a fairly convincing Lord Vetinari. I also liked Chris Bunn as Leonard of Quirm, who came over a bit like John Cleese as M in the Bond films. The Colon/Nobbs partnership worked well, with lots of humour. The set and props were good. Most of the costumes were good too, but I would have preferred Lord Vetinari's outfit to be different as he appeared to be wearing an overcoat, which didn't seem right to me. The only character that didnt "feel" right was Detritis who was not "Troll" enough for me. I thoroughly enjoyed the show. My husband liked it and was able to follow it, even without knowing the story in advance. I am not going to detail the story, most DW readers will know it. If you haven't read the book, I thoroughly recommend you do. You don't need a lot of DW knowledge to follow the story easily. There was a raffle during the interval but I don't know what the funds were for. As it was Sir Terry's 70th birthday, it would have been nice to see a collection for RICE or the Oranutang foundation. Well done Castle Players. I will definitely keep an eye out to see what other plays you are putting on in the future. At the end of April a few of us Wincanton Loonies trooped off to Lytchett Matravers – just north of Poole – to see Jingo performed by the Castle Players. Like many groups dotted around the country, they had timed their production to coincide with, what would have been, Terry's 70th birthday. One issue I can have with these plays, or any book or film adaptation for that matter, is that the actors may not play the characters as you have imagined them. There were a couple of cases of some people not being how I visualised them, but that is usual with a small group of people from which to choose. But everyone was 'in character' and if had not read the book, at least had had it explained to them so they knew how their characters were supposed to act & feel. As is often the case with smaller groups, actors share multiple parts. Sometimes this is obvious. Others, not so, simply through good acting. I had realised that Lord Rust & Al-Jibla were played by the same person, even though Al_Jibla had half his face hidden. But it wasn't until the second half that I realised he was also Leonard. This is because one; he played the parts so differently and two; when playing Leonard he seemed to be, intentionally or not, impersonating Terry Pratchett. Either him or it was a very good David Bellamy. This was the first time I had seen Jingo and upon first viewing it was excellent. It did not seem to leave anything out but as the audio book is pushing 8 hours and the play was only 2 and bit hours I assume some things had gone. Recently I had seen Men at Arms and I could feel we were missing bits out, sometimes to the detriment of the story. Here we were not. Some events were obviously compressed for example the fire at the embassy. In the book, it is quite a big event. In the play it is dispatched in a couple of sentences like…. The Klatchian embassy burnt down, the prince was rescued, but injured. Something like that. One difference being that Vimes was not there. 'Gentlemen, please,' said the Patrician. All in all, it was an enjoyable evening. We had attended their first night and there were no noticeable fluffs or prompts. If this group decide to do another of Mr Briggs adaptations, we will be there. On 28 April, on what would have been Sir Terry's 70th birthday, we went to see the Fifth Elephant production by the Chelmsford Theatre Workshop in the Old Court Theatre in, yes, Chelmsford. Played to a full house, great fun was had by all - ethpethially Igor (and Igor and Igor, not forgetting Igor) who caperred lopthidedly and with great enjoyment throughout. Stephen Brigg's adaptation of the book includes most of the action, except for the Colon/Nobbs subplot back in Ankh Morpork, and does so very well. The production was played with minimal props against a backdrop of stone walls that at various times represented Vetinari's office, the walls of Bonk, the Schmaltzberg caverns, Sam's cell, Lady Margoletta's castle and that of the Werewolves, the mountains and the sisters' cottage. And probably other places too. Scene changes took place in blackout and fight scenes were strobe-lit. The actors were well cast, although not always close to the descriptions in the books - which didn't matter once the play is under way, although in my mind's eye an Angua without long blonde hair, however well acted, just seems wrong! A cheeky Gaspode acted as narrator where needed. Several of the cast doubled up on roles but this worked well in practice. From the Patrician's office all the way to the final denouement in Bonk the play moved along at a good pace. The cast made good use of the available space, at one point using the auditorium right by the front row. I had to uncross my legs for fear of kicking a dwarf, or even worse, Commander Vimes! We mustn't leave out the unsung heroes of any theatrical production, the Tech crew. Lighting and sound all went without a hitch and the use of the back wall as a projection screen to show progress on a mapp worked really well. After the curtain calls an image of Sir Terry was displayed and left for everyone to ponder on. The very well produced programme was worth buying as a souvenir too, and not just for the "Ask Igor" column at the back. All in all it was a good play, well acted and well worth the visit. Highly recommended, and there was a charity collection in aid of the Alzheimers' Society too. The Fifth Elephant at the Old Court Theatre, Chelmsford (which, for anyone who finds these things funny, is directly opposite the prison!) was a great surprise – thoroughly enjoyed and remarkably faithful to the book. We were warmly welcomed by the Director, Mark Preston and shown to our seats, which gave a good view of the sparse but appropriate scenery which was used well during the performance. The scenery certainly did not get in the way of the acting, and by being condensed, kept the audience's imagination flowing. Costume was therefore important and was used well, as was the special effects – for instance the strobe lighting over the fight scenes. Our introduction to the Disc and the story itself was by way of Gaspode the Wonder Dog, played very amiably (and with a cockney twang) by Anna Harris. He did pop back from time to time to give the audience a quick update on the characters, or help with the plot and although (as a dedicated Pratchett fan) I found this slightly irritating, I can imagine it was a boon for the non-Pratchett person to keep up. Our first full scene was Vimes and Carrot being sent to Uberwald by Vetinari. From the off, the actor playing Vimes (Mark Sutton) was absolutely brilliant in the role – he had the exact tone and tilt of the head you would expect of the world-weary Vimes, the exasperation and slight contempt was just spot on. I was amazed to learn that this was Mark's first foray into acting as he was very accomplished. Carrot, played by Giles Margerum was indeed tall, red haired and amiable and the friction between him and Angua wistful and heartfelt. Ben Frazer was a youngish Vetinari (who also played more convincingly Wolf von Uberwald) and was a might too good looking and reminded me of Chris Sarandon as Prince Humperdinck in the Princess Bride and not the cadaverous Patrician. He fitted better the role of the scary Wolfang, exhibiting Chris Sarandon as the vampire in Fright Night and I was convinced he would bite Vimes with much relish! Robert Evans as Detritus was amazingly lumpy and very troll like, and menacing in the right places ("We are not at home to Mr Reasonable, Sir") . Caroline Froy as Lady Sybil was patient and loving (although could have been slightly posher) , but the performance was very good. Special mentions should also go to Ashleigh Mears as Sargeant Angua and Charlotte Norburn as Cheery. Inigo Skimmer was perfect with the nasal, irritating 'hmm hmmm' and was played by Martin Robinson with the best civil servant obsequiousness he could muster. I enjoyed watching Skimmer being brought to life – Martin was brilliant in this. An absolute tour de force performance by Lewis Clark as Igor was hysterically funny, physically spot on and an absolute hoot! I was taken back to the performance of another Igor, Marty Feldman in Young Frankenstein and laughed all the harder for that! In fact, Lewis played all of the Igors ("No, I'm Igor, he's IGOR!") , which got a great laugh! Lady Margolotta played by Hannah Burton was very Marlene and vampish. The play was a complete romp all the way through Uberwald, the three Glum sisters, the wolf pack, Gavin were all present and correct (although we did miss Death in the pool scene – a mainly Pratchett fan gripe!) . Like the book, the scenes were episodic although the scene changes could have been managed better and taken less time. I loved the little touches, for example the Star Wars – Darth Vadar theme when Vetinari left the stage, the LOTR's style map at the back to show their progress across the snowy wastes, the Little Red Riding Hood red cloak worn by Angua, the Indiana Jones theme. One audience member was absolutely enjoying the play and laughed loud and heartily all the way through. The dwarves were delightfully dwarfish, especially Rhys Rhysson ("Look you, boyo") and Albrecht Albrechtson. A few performances were wooden but all in all this was an excellent production with much praise going to the main cast, the direction and the backstage crew. Congratulations, guys – can't wait for the next one! In my time, I've seen many productions of Pratchett adaptations; I've even been in a few. But Guards! Guards! was one I hadn't seen. So I was pleased to get the chance to see this production, particularly as it took place on what would have been Terry's birthday. The set was excellent - I particularly liked the portraits of Terry and Wuffles above the Patrician's desk - and it was pleasing to see it used so effectively in telling the story. Equally impressive were the special FX, which included real flames. The strong ensemble cast were all wonderful and were led by a strong performance by Simon Lloyd as Vimes. Two in particular are worthy of mention. Leonie English was brilliant as Sybil; all cut-glass vowels and flirting shamelessly with an oblivious Vimes. Paul James was a note perfect Dibbler. There were two things I felt didn't work. It'd be mean to criticise David Hartley's portrayal of Vetinari but his interpretation was not the Patrician I have in my head. Secondly, there were some scenes where actors not involved in the main business at the time literally got up to funny business. Whilst these comic asides did elicit laughter from the audience, for me they distracted attention from the main thrust of the plot happening elsewhere on stage. asked me if the book was as good as the play, I assured them that it was. I bet you half a dollar (as Nobby would say) that they've now got their hands on a copy of Guards! Guards! Delighting die-hard fans and recruiting new readers, this wonderful show was the best production of a Pratchett I've yet seen. CADOS (Chorley Amateur Dramatic and Operatic Society) presented Guards! Guards! Adapted by Stephen Briggs at Chorley Little Theatre. I attended the Thursday 26th April presentation and had a very pleasant evening as the rest of the audience seemed to have, judging by the laughter. The casting mostly fitted my mental visualisation of people with the possible exception of Vetinari (David Hartley) who was too 'nice', not quite so icily aloof as I imagined. (Not sure how they could have seen inside my head when the cast the play though (probably a good job)) . Hard to single out particular people although Colon (David Greenfield) and Nobbs (Jacob McAllister) settled well into their respective characters. The dragon (s) and footnotes were well done with Lady Sybil Ramkin (Leonie English) a very believable sick dragon carer. Overall an enjoyable evening and I look forward to their staging any of further adaptations. We would like to wish a very Happy Birthday to everyone who has a birthday this month but special Discworld Monthly birthday wishes go to: David Northey, Lee Potts-Pointer, Keir Brown, Bonnie Johnson, Carole Fletcher, Elizabeth Alway, Francis Whitefoot, Mandy Oldroyd, Stuart Peek, Zachary Agatstein, Richard Atha-Nicholls, Jen Linsey, Osman Gothamy, Lisa Blackwell-Dickinson, Claire McKay, Billy Jowett,Donielle Gross, Vanessa Whybrew, Marjorie Ulisa Fletcher, Paul Alexei Smith, Lucas Abell, Steph "I'm 40" West, Andrew Perry, Ruth Delaney, James Ross, Margaret Elliott, Annette C Wright, Eric Jarvis, Becky Fideos Cordingley, Alison Trace, Martin Langley, Sarah Murphy, Philip Robert Young, Gareth Milford-Scott, Christine Buckley, Tanya Melton, Claire Bennett, Jane Amanda Smith, Peter Mills, James Hanlon, Frankie Murphy, Anders Spein, Elaine McCabe, Sheila Wicks, Claire Wilmshurst, Jason's little sister Karen Alexander, Stephanie Wendy Lee and a happy 60th to Pamela Smith. Last month we purchased a copy of The Amazing Maurice And His Educated Rodents featuring the new cover art by Laura Ellen Anderson to give away. Q1. When Militia say "Of course, it would be more ... satisfying if we were four children and a dog" to whom was she referring? The answer, of course, was Enid Blyton's The Famous Five. We pulled a winner randomly from the electronic post bag and declare the winner to be: Jill Nicholls of Batley, West Yorkshire. We'll get your prize in the post just as soon as we can. We assume any correspondence is eligible for use in the newsletter unless otherwise stated, including the sender's email address. We may edit your letters by putting them through the washing machine and hanging them on our line. You're keeping up the TP tradition of thoughtfulness, kindness and fun makes it a tiny bright spark of goodness in an otherwise troubled day for me. Really liked headbanger = Ironmaiden like for Carrot. TP was met by me twice I was impressed by his genuineness, kindness, ability to connect, his books got me through sad times and quakes, but now lie on shelves, loved, but I am almost afraid to open up and read, yet Vimes always gives me hope for humanity all things despite. Keep on ...there's a lot of sad and depressed folks who really need you... if we could deal to our disrupted lives and not be depressed it would be great, in interim TP discworld is one of many valuable lifelines. * From: "David M. Witchalls"
Just seen a new cider in Tesco (called Hog Father - picture provided) . I had a double take but on inspection, there is no reference to Discworld - shame. Paul Kidby's Discworld artwork goes on display in this wonderful touring exhibition. Alongside a miriade of Discworld artwork lies Paul's Charmed Realm series of images. Beautiful to look at, even more beautiful on your walls at home. Prints are available at the museum gift shop and on Paul's website. 25% discount for those who arrive in costume. Join Birdworld on the 26th May for Discworld Day at the Terry Pratchett Owl Parliament! See special guests from the Discworld Family, celebrate the "Glorious 25th of May" in honour of Sir Terry Pratchett and take part in fundraising for the Birdworld Conservation Fund. Fantastic costumes encouraged and prizes to be awarded to both best dressed adult and child! To celebrate the day, visitors will be invited to join in with plenty of Discworld fun and games throughout the day including, a themed quiz trail, costume prizes for both adults and children, a charity raffle packed full of prizes, educational talks including an owl-themed flying display and even a special Q&A session for fans with Rob Wilkins and Stephen Briggs. Book Club that discusses Terry Pratchett's books. This month Reaper man. Everyone Welcome. A recreation of Terry's study where he wrote his best-selling books, complete with desk,computer, screens and many of the weird and wonderful objects he had around him when he wrote. This will be on show all week. Also specially built for the Festival is The Shed of Doom, a fittingly fantastical tower to welcome you to this very special exhibition. There will also be two special Discworld ticketed events. Saturday's ticketed event is a talk with Rob Wilkins entitled The Write Fantastic - Terry Pratchett, a talk all about Terry's life, his work and his passion for the Chalke. Sunday's ticketed event is a magical show from the Ankh-Morpork Guild of Conjurors - Morgan & West Time Travelling Magicians. Both events require separate tickets, but the good news is that they include entry to the Festival as well. Rob's talk is priced at 14.50GBP per person and The Conjurors event is priced at 15GBP per person. This IDWCon we'll be visiting the Discworld region of Überwald, focusing on the delightful village of Schnapp, whose inhabitants are keen to tempt tourists to their Sektoberfest. Schnapp's tourist board will be sending out promotional material and further information as we near the convention, so make sure you sign up to their newsletters to keep up to date. The newsletter will only include any listings that are new or have changed within the last 30 days. This is something we've not included in the newsletter for a while. If you want to try to sell your unwanted / duplicate Discworld items to other fans (and its legal for you to do so) email us at with the subject "Ads" and a short description of what you have and how fans can contact you. Discworld Monthly only lists the ads and is not responsible for the contents, validity or reliability of the ads or the buyers and sellers. Jesse Wiebe writes: I'm doing a major purge of my bookshelf, and am looking to sell some of my Pratchett collection. I have a few signed, some first editions. Most are in like-new condition. I was going to list them on Amazon but thought I'd give Discworld Monthly readers first dibs. If anyone's interested, please email me at for a list. Thanks! (ships from Canada) . Steven Dean writes: I have been a book dealer at every UK DWCon since 1998 but have decided not to attend any future ones. To that end I have some signed books for sale. Prices start at 25GBP plus postage. If anyone would like a list of what's available please drop me a message. Fancy a holiday to the land of the librarian and a universe full of wonders? Though it it would be too expensive? Then look no further...join Andrea, a life long STP fan and conservation biologist, at her guest house in North Sumatra, Indonesia. Not only can you go jungle trekking to see if you can spot the librarian and his friends. the monkeys (well, not actually friends..more like acquaintances) . You can also go on village walks, do cooking class, go river swimming and so much more. Have a look at her website and drop Andrea and email or whatsapp with any questions at all. There's a 5% discount if you start your email with your favourite discworld quote! "It was the special sort of beautiful area which is only beautiful if you can leave after briefly admiring its beauty and go somewhere else where there are hot tubs and cold drinks. Actually staying there for any length of time is a penance." Spenser Personal writes: I am an avid fan of Discworld and have over the last 30 years I have collected clarecraft figures and have the complete set (including rare pro types) . Sadly we need to consider downsizing the collection and will begin to sell them on auction sites. However, before I do, I wondered if you know of any fans that might be interested in buying parts of the collection through your newsletter? Margaret Matthews writes: Some years ago I bought my husband a Death of Rats pin. He wore a tie to work, usually a loud one with an unusual pin. It was his favourite and drew quite a lot of comments and began several interesting conversations. Alas he lost the pin and we have never been able to find another. It is not helped by me being unable to recall where I bought it from. We are both retired now but I would love to be able to get him another one. Has anyone got one for sale? This month's issue is brought to you by the adventures in Birdworld, the shed of doom and a couple of awards. 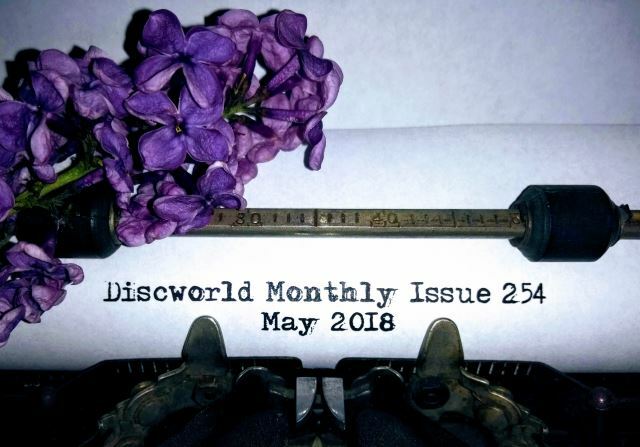 Please let us have any submissions for issue 255 of Discworld Monthly by Friday 22nd June 2018. A1. Your finger, you fool. 2.9 Troll Bridge News - The end is nigh - The trailer is HERE!